Whom do students ask for help when learning? Other students. Lauren Scharff, professor of psychology at the United States Air Force Academy, looks at how students can best help their peers learn more effectively. 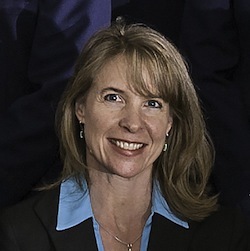 Dr. Lauren Scharff is the Director for the Scholarship of Teaching and Learning (SoTL) Program and Professor of Behavioral Sciences at the U.S. Air Force Academy, where she has worked since 2008. Prior to that she was a professor of Psychology in the Department of Psychology at Stephen F. Austin State University where she worked beginning in 1993. She completed her Ph.D. in Human Experimental Psychology in December, 1992 from the University of Texas at Austin. Courses she has taught include introductory psychology, leadership, research methods, biopsychology, and perception, and she has won several teaching awards. Her current research focuses on a variety of topics within SoTL, although she sometimes still collaborates on research projects in the human factors or visual perception areas. Dr. Scharff is a past president of the Southwestern Psychological Association and is currently serving as the United States Regional Vice President for the International Society for the Scholarship of Teaching and Learning. She is co-creator of the award-winning Improve with Metacognition website. Would you be surprised to learn that both students and instructors show higher levels of awareness of inefficient learning strategies than of effective learning strategies? Unfortunately, not only is that true, but data also indicate that students are more likely to implement inefficient strategies when trying to learn. How can we help make it more likely that students use the more effective learning strategies? At the United States Air Force Academy, we are in the 4th year of a Science of Learning research project that combines the efforts from our Center for Educational Innovation, Student Services, and a group of students who are part of a recently formed Science of Learning Team. We know both from the literature and personal experience that students are often more likely to listen to other students than instructors when it comes to advice about how to learn material. Our student team gets trained on the Science of Learning, and then we lead seminars for our peers. These seminars are required for students on academic probation, but all students are encouraged to attend. They are titled, Study Smarter, not Harder. As part of the ongoing study we collect data on awareness and implementation, and investigate how attendance at the seminars impacts those factors. We are showing positive shifts and have received many thank yous from the students who have tried new learning approaches and found greater success. It’s been exciting working on this collaborative project and seeing the students help their peers to learn more effectively. There is a wealth of Science of Learning research that needs to be better implemented, and this is one great example of how that can be done.